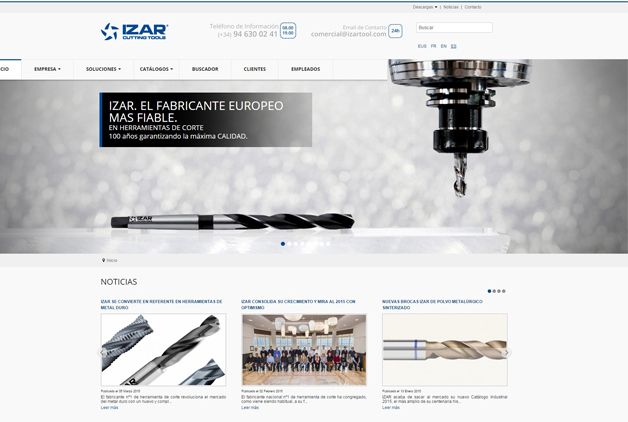 The website launched by Izar stands out for its USEFULNESS and DESIGN, enabling internet users to also have a look at the factory on the inside. The new website includes a TOOL SEARCH ENGINE that users can access via material to be worked or through the product description. The aim of this search engine is to provide users with the most efficient tool to carry out the work they have to do, or to provide dealers with the appropriate tool to recommend to their customers. It is also possible to access the tool WORKING CONDITIONS. Further to the above, it is boosted with a PRODUCT COMPARATOR, where users can choose one product or another according to its characteristics. Another new aspect is the VIRTUAL TOUR, where internet users can learn what IZAR is like on the inside; in other words, the most modern cutting tool manufacturing plant in Europe, visiting the offices, the bit and tool production areas organised into cells for greater efficiency, and finally reaching the oil and coolant oil filtering area, a model for their reuse at the actual plant. For the most curious, we are enclosing the link: http://izartool.com/visitavirtual/izar.html. Other remarkable aspects are the journey that IZAR makes through its HISTORY, -more than 100 years manufacturing cutting tools -, or through its VALUES, as IZAR has been acknowledged several times as a company that is committed to Corporate Social Responsibility. All of this in different languages, as IZAR exports its products to more than 80 countries.